A watermark is faint text or image in the background of the document. 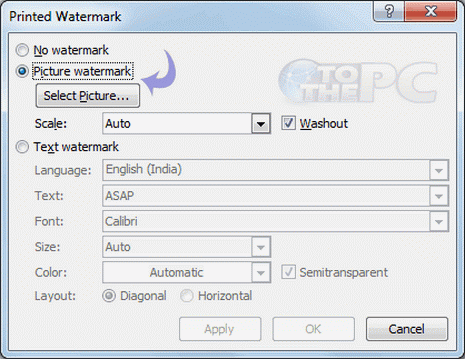 Watermark enhances the appearance of your document and also serve as added protection from illegal copying of documents. For example, official company documents have their official logo or company byline text on background of each page in a document file. 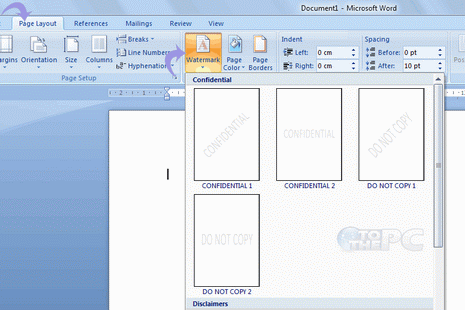 You can similar watermark to your Microsoft Word document files. 1. Open Microsoft Word 2007 or 2010 program on your computer. 2. Click on the page layout ribbon & click on Watermark. 3. You can choose from the custom options that are are available or you can create your own watermark by clicking on Custom watermark. By this you add your selected picture or any text to the background. 4. Click on Apply when done. A cool watermark will be applied to all the pages of the document. Easy, isn’t it? I am tired of always having to go to “custom” to get the “draft” watermark. I use it all the time. Isn’t there someway I can make it a default or part of the standard watermarks that first show up?